Your profits are in your prices. Where are the psychological triggers you can use to raise your prices and charge more? You'd like to be able to charge a premium for your services and rake in the big bucks, right? Then why are so many physicians and clinics utilizing the slow death spiral of constantly trying to undercut the competition and using discounting coupon services like Groupon. Why are some physicians able to charge 50% more for Botox and others are trying to give it away and scrambling for any new patient. Where's the disconnect? Look, there are only two things that determine ANY price. Put these lines on a graph. How much you're willing to sell something for. How much someone's willing to pay for it. As a physician running a cosmetic medical practice or medical spa, when you’re essentially selling time, how do decide where you can set — and then raise — your rates? Guess what? People actually want to pay a lot. I learned this as a young painter in New York. My paintings sold between $25,000 and $60,000. Why? It's pretty simple. I wouldn't sell them for less and I could easily get buyers who would pay that amount. I could find lots of buyers that would purchase my work as fast as I could produce it. I had both the skills and business savvy to understand that the quality and uniqueness of my work created the demand and drove up my prices. I didn't just set my prices high. I started by creating a unique niche that I completely dominated; beautiful, realistic women in oil with old world craft. I would never have been able to charge $60,000 for paintings that no one wants and anyone could produce. Even more, I set myself up as able to demand those prices. Believe me, no one want's to pay $50,000 for a painting. They only pay that amount for a story, and the story is around something that's unique and scarce. People want to pay a lot for cosmetic treatments. If you don't know it already, you're in the vanity business. People will pay outrageous prices for vanity. Think of the prices that high end vanity commands; $600 for a felt purse by Kate Spade, $1,150 pumps from Christian Louboutin, the $84,000 Audi A8, the Omega Seamaster watch, any Apple product... The cost is actually integral to the enjoyment. People want to pay a lot for your cosmetic treatments IF you position yourself correctly AND your treatments are both unique and scarce. No one wants to pay more for the same coach seat on an airline, but there's obvious satisfaction when someone describes the purchase of an expensive luxury item, even if the price is never mentioned. If you cater to the lowest common denominator, you'll have to price your services that way too. Specialize in a lucrative niche and your services become not only unique, but scarce as well. Uniqueness and scarcity work hand-in-hand to drive up demand and allow you to raise your rates. So uniqueness and scarcity are primary ingredients to any offering that want's to charge a premium. We'll deal with both uniqueness and scarcity in other posts. What I want to talk about here is the psychology of pricing and how it relates to your own pricing and your customer loyalty. Once you have something that's both unique and scarce, you can move on to increasing your prices. I’ve met many, many physicians who under price their services.The primary reason that's give is that they have to have low prices to remain competitive in an every more productized marketplace, where every corner has a medical spa trying anything to attract new clients. A low price tells patients that you’re not worth it. It may be all smoke and mirrors in the beginning, but if you want to be perceived as the best, you’d better price your services accordingly. Low prices are THE primary indicator of low quality. I've seen any number of small clinics where the marketing and pricing plans, if there was one, wasn't well articulated or just rattling around in the physicians head. As a result, these clinics, in an effort to build their own business, underbid services on low quality clients. As a result, they ended up with lots and lots of low fee procedures and special offers. Instead of focusing on high quality premium treatments, these staffs are pushed to get things done as fast as possible to keep the treatments profitable despite the low fees. This poor quality of training, service and oversight leads to mistakes. Clients nitpick and try to get additional discounts or haggle about pricing. Accounts receivable grows. Lawsuits happen. It's no surprise when clients start leaving for the next low bidder to open up shop. One of the primary components in positioning yourself is how you price your services. As price goes up, so does your perception of quality AND pleasure (satisfaction). A well known study out of the California Institute of Technology and Stanford University details how price influences peoples perception of quality in wines. Antonio Rangel, an associate professor of economics at Caltech, and his colleagues found that changes in the stated price of a sampled wine influenced not only how good volunteers thought it tasted, but the activity of a brain region that is involved in our experience of pleasure. In other words, "prices, by themselves, affect activity in an area of the brain that is thought to encode the experienced pleasantness of an experience," Rangel says. The subjects consistently reported that they liked the taste of the $90 bottle better than the $5 one, and the $45 bottle better than the $35 one. Scans of their brains supported their subjective reports; a region of the brain called the medial orbitofrontal cortex, or mOFC, showed higher activity when the subjects drank the wines they said were more pleasurable. But the experiment was rigged. While the subjects had been told that they would taste five different wines, they had actually sampled only three. Wines 1 and 2 were used twice, but labeled with two different prices. One wine 2 was presented as a $90 bottle (its actual retail price) and also as a cheaper $10 wine. When the subjects were told the wine cost $90 a bottle, they loved it; at $10, not so much. In a follow-up experiment, the subjects again tasted all five wines but without any prices; this time, they rated the cheapest wine as their most preferred. Previous marketing studies have shown that it's possible to change people's perception of how good an experience is by changing their beliefs about the experience. For example, moviegoers report liking a movie more when they hear how good it is beforehand. Studies show that the neural encoding of the quality of an experience is actually modulated by variables such as price, which people believe is correlated with experienced pleasantness. The results make sense. Your brain encodes pleasure because it is useful for learning which activities to repeat and which ones to avoid, and good decision making requires good measures of the quality of an experience. But your brain is also a noisy environment, and "thus, as a way of improving its measurements, it makes sense to add up other sources of information about the experience. In particular, if you are very sure cognitively that an experience is good (perhaps because of previous experiences), it makes sense to incorporate that into your current measurements of pleasure." Most people believe, quite correctly, that price and the quality of a wine are correlated, so it is therefore natural for the brain to factor price into an evaluation of a wine's taste. Cognitive dissonance is that uncomfortable feeling you get when you're holding conflicting ideas simultaneously. The theory of cognitive dissonance proposes that people have a strong motivational drive to reduce dissonance since it causes internal conflict. They do this by changing their attitudes, beliefs, and actions. Dissonance is also reduced by justifying, blaming, and denying. It is one of the most influential and extensively studied theories in social psychology. I'm not trying to force a psychology degree on you but it is useful to have understanding some basic underpinnings of behavior and how they affect pricing, such as why critics don't like your favorite wine, and how wineries get away with charging $500 for a bottle. Have you ever noticed fans almost never complain about lousy music concerts or albums, yet critics frequently give them poor reviews? What's going on? Are critics just inherently nasty? Maybe, but the fact is that there's a psychological principal at work that's also in effect every single time you exchange something of value (money) for a product or service. Here's an example of cognitive dissonance at work. In a landmark study by Leon Festinger and James Carlsmith, seventy-one male students in the introductory psychology course at Stanford University were asked to spend two hours doing a very boring task, sticking wooden pegs in holes. Participants were divided into three groups. Some were paid $20 (a lot of money back in 1959). Some were paid $1. And some were told they were volunteers and paid nothing. All were told what their payment (or non-payment) would be before they began. After two hours of what was surely hellish tedium, participants were asked to rate the 'enjoyment' of the task. So what do you think? Which of the groups ($20, $1, nothing) thought that sticking pegs in holes for two hours was the most fun? Here's the answer: The group that was paid $1 found the task most pleasurable. The group paid $20 found it the most boring. Why? Cognitive dissonance at work. If you are induced to do or say something which is contrary to your personal opinion, there is a tendency for you to change your opinion to bring it into correspondence with what you have done or said. The greater the pressure used to elicit the overt behavior (beyond the minimum needed to elicit it) the weaker the tendency to change the opinion. Let's discuss the first point. In the peg study the task was, objectively, tedious and boring, but people who were paid $20 could easily explain to themselves why they did it: they wanted $20. They rated the task as the most boring. People who were volunteers and got nothing could tell themselves they did it to advance science. They found it less boring than the $20 group, but still somewhat boring. But here's where cognitive dissonance comes in. The people who were paid only $1 couldn't reconcile with themselves why they spent two hours putting round pegs in round holes. Their brain held two dissonant thoughts: "This task is dull" and "I'm wasting my time for a $1." The second statement was 'fixed' and couldn't be changed, so the brain unconsciously modified its belief about the first to decrease the conflict. People decided they were having fun; otherwise they would be fools for doing it at all. But don't forget the second point; The greater the pressure used to elicit the overt behavior (beyond the minimum needed to elicit it) the weaker the tendency to change the opinion. This is why the 'soft sell' can be so effective. Using less 'pressure' to elicit the behavior actually results in the strongest tendency for a person to modify their opinion. Let's apply this lesson to how pricing affects the enjoyment of a product or service. When you pay for anything; food, Botox, liposuction, or wine — your brain knows the price, and you're pretty sure that you're not stupid. So, if you pay $200 to see a live band and they're all singing off-key, your brain can change its evaluation of the performance to "charmingly gritty and spontaneous" or "incredible live performance". Your subconscious is pushing you to find the experience pleasurable. But the critic sitting in back didn't pay for his tickets. He's just there to do a job, and his brain knows that. If the concert is bad and he says so, that doesn't make him a fool for going, he's just more objective. Think about it: How often have glossed over a obvious shortcoming in order to avoid tainting your enjoyment of something you've paid a lot for? I know I do it all the time. Here's what W. Blake Gray says about cognitive dissonance and wine. The more money the wine costs, the more powerful the effect of cognitive dissonance. You can freely diss Two Buck Chuck, but that overripe $60 Syrah? It must have some good points. Many Napa Valley vintners understand the implication of this: Charge more, and while the wine might be difficult to sell, people who do buy it will like it more. Hows that for increasing your customer satisfaction? Why does Robert Parker give higher scores to wines than other critics? To his credit, he is well-known for paying for a lot more wines than any other critic. He chooses what to pay for, he doesn't taste blind, and I submit that even for a man whose palate is as consistent as anyone in the business, cognitive dissonance is at work. Why don't professional critics rush to embrace funky, expressive wines, especially those in niche categories? We don't have to; we don't have the cognitive dissonance of "I paid $12.99 for this no-added-sulfite 'organic wine' and it smells like feet." Mmm, feet. How do the Bordeaux first growths get away with those outrageous release prices -- over $500 a bottle for some? In Hong Kong, people are thinking in Cantonese, "I paid $900 for this wine. And I am no fool. This is so worth it." Cognitive dissonance knows no language barrier. Of course pricing isn't the only factor we're discussing. Let's talk some cognitive dissonance and how it leads to irrational customer loyalty, just what we're looking for. In a study looking at why cognitive dissonance with dentists and their patients, Duke University behavioral economist Dan Ariely revealed the probability of two dentists separately finding the same cavity in an X-ray as being about 50%. And often, what dentists think is a cavity, turns out to be nothing. All the more odd, then, that as patients, we’re incredibly loyal to our dentists - more faithful, in fact, than to other medical practitioners. "Dentistry is basically the unpleasant experience. They poke in your mouth. It's uncomfortable. It's painful. It's unpleasant. You have to keep your mouth open. And I think all of this pain actually causes cognitive dissonance - and cause higher loyalty to your dentist. Because who wants to go through this pain and say, 'I'm not sure if I did it for the right reason? I'm not sure this is the right guy.'" But cognitive dissonance accounts for more than our loyalty to dentists. It also generating increased revenue for dentists and adding to their profits. And it increases over time. Imagine that at some point in your dental treatment, you have a choice between two treatments that have exactly the same possible outcome, but one of them is more expensive to you and better financially for the dentist. Which one would you choose, and how would the duration of the relationship with your dentist be affecting that? It turns out that the more time people have been seeing the same dentist, the more likely the decision is going to go in favor of the dentist. People are going to go for the treatment that is more expensive but has the same outcome. More out of pocket for them, more money for the doctor. So in this case, loyalty actually creates more benefit for the dentists with no better potential outcome for the patient. Now, while it may sound like I'm advocating standing on a patients toes while injecting Botox... not so. There may be some effect of cognitive dissonance at work when you're performing a Melasma or other treatment where there's some pain and downtime, but what we really want to focus on here is how pricing your treatments higher, can actually increase both your patient satisfaction and revenue at the same time. Does A Premium Price Drive Actual As Well As Perceived Value? I would say yes in many instances. Take a look at our medical spa training manuals and you'll see that they're more than a big hardcover at Barnes & Noble, much more. But we deliver on those prices since the quality of the content is so far above what you can get elsewhere. This isn't generic information, it's specialized, and it's valuable. The medical spa staff training manuals are priced where they need to be to make the creation and distribution profitable enough that it's worth creating AND creates an incentive for buyers to actually use the information. Some of the most successful medical spas and cosmetic clinics around are using these training manuals. Do you think that someone who's at all serious about their business thinks anything at all about dropping $300 on a product that can optimize their operations and train their staff? Are you kidding? Sure, I could give all that stuff away. Perhaps there are those that think that I should. This isn't for them. We give away 99% of everything for free already, but real products that give you the most benefit aren't valued if they're free. It's not about information. It's about motivation. Paying a premium for them actually gives you more value... and pleasure. Look, you know more about your own situation than I do. I'm not trying to convince you to raise your prices if you can't support it, but hopefully you've got something to think about. There's a lot of obvious, anecdotal and researched evidence that shows that higher prices will make you more money and make your patients happier... but pricing is the second step. Creating a service menu and reputation that is unique and scarce is step one. 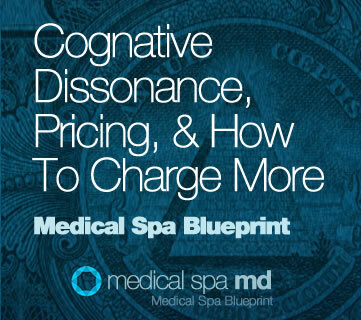 Pricing is one of the things that all physicians and medical spas struggle with. It is one of the handful of items that actually dictate how much money your clinic will make and where your profits are. One last point: You've been reading this post for something like 3 minutes now. Isn't this the most interesting blog you've ever read? Please tell your physician friends. They're no fools either. The Medical Spa Blueprint: This post deals with some of the topics we'll cover in The Medical Spa Blueprint, a guide to opening and operating a highly successful and profitable cosmetic medical clinic. To be notified when the Medical Spa Blueprint is available, just join Medical Spa MD. It's free, which is a terrific price. Marketing actions can modulate neural representations of experienced pleasantness published January 14 2008 in the early online edition of the Proceedings of the National Academy of Sciences. William H. Cummings, M. Venkatesan (1975), Cognative Dissonance and Consumer Behavior: A Review Of The Evidence in Advances in Consumer Research Volume 02, eds. Mary Jane Schlinger: Association for Consumer Research, Pages: 21-32.